A huge chunk of my gardening life took place in the hot, humid climate of Alabama, where spring passes fast and summer goes on forever, with more than 250 days between frosts. The peas of choice were not garden peas (Phaseolus species), which merely served as spring aphid bait, but crowder peas (Vigna unguiculata), one of the most stalwart crops of summer in warm climates. I grew the super-productive 'Pinkeye Purple Hull' variety every year, which is a wonderful crowder pea in the garden and on the table. Dependable and easy to shell, the pods of Purple Hull varieties turn dark purple when they are ready, taking the guesswork out of harvesting. I also enjoyed exploring long-vined heirloom varieties like heat-tolerant 'Red Ripper', which will cover a head-high trellis and keep going, bearing pea-filled pods through the second half of summer. 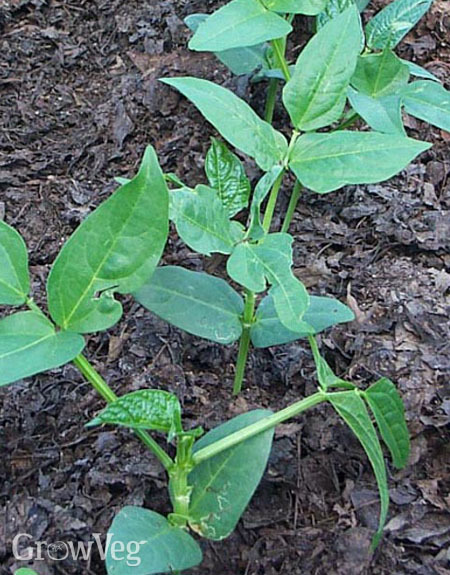 Often called southern peas or cowpeas, these and numerous other varieties of V. unguiculata show a huge range of colours and growth habits, and they are among the most nutritious legumes you can grow for yourself or your garden. Back in the 1980's there was a short-lived movement to rename them "protepeas" because of their high protein content, which hovers around 25 percent. When used as a summer cover crop, crowder peas shade the soil, suppress weeds, attract beneficial insects, and accumulate soil biomass and nitrogen. After moving to a cooler climate, I gradually gave up growing the crowder peas that thrived in Alabama, which didn't reach their full potential in my mountainside garden. I had assumed the same would be true with yard long beans (V. unguiculata ssp. sesquipedalis), but then I saw a wildly successful planting at the Chicago Botanic Garden, which has a frost-free season of only about 170 days – about what I can offer in my current garden. 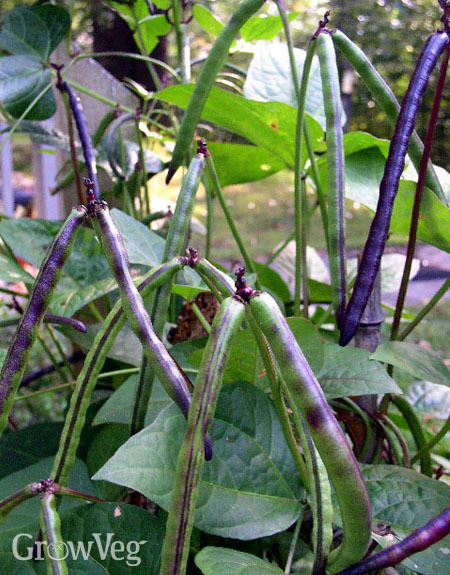 I quickly got busy trying varieties of yard long beans, which produce only a few widely-spaced beans in each pod, but the pods are infinitely edible until they are about 18 inches (46 cm) long. Every variety I tried was successful, including green-podded 'Orient Wonder'. But my favorite so far is 'Red Noodle', which does something no other bean can do – it keeps its purple-red colour after it is cooked. In addition to using my red yard long beans in beautiful summer stir-fries, I blanch and freeze 'Red Noodle' beans cut into bite-size pieces, and add them to winter soups and casseroles. Native to western Africa, the parent species of today's crowder peas and yard long beans faced a long list of challenges from insects, diseases and weeds for which they developed several novel defenses. Glossy leaf surfaces shed water which helps limits diseases, and the roots and leaves contain substances that discourage weeds. To provide defence against insects, both crowder peas and yard long beans have special glands called extrafloral nectaries that exude sugary substances which attract ants and wasps in search of nectar. The ants and wasps in turn help defend the plants from other insect pests, which are rare when crowder peas and yard long beans are grown in gardens in the Northern Hemisphere. Indeed, you can expect no pest problems at all when growing crowder peas as a cover crop, either by themselves or in combination with oats or another grassy cover crop plant. Because my cover crop plots are usually small and short-lived, I often use crowder peas alone as a midsummer cover crop, and pull up the plants or chop them under while they are still young. Substantial nitrogen is left behind in the soil because the plants don't use the nitrogen they manufactured and stored up in little root nodules. Instead it goes to nurture my fall leafy greens, which need no additional fertiliser when planted after a quickie crowder pea cover crop. "I'm not sure I would want to grow a plant that actually attracts ants and wasps. These would definitely make it unpleasant to work around the beans. I think I would rather worry about the weeds. At least they didn't get irritated and sting! "